For the Remote Sensing I just wanted to limit the range. The more ranks, the greater the range. I could increase the ranks and add reduced range modifier. I will review the Mind Reading again tomorrow to see what I did with that. I was tweaking the build often so I may have made an error. Motivation(Necessity): Victoria never asked to have the “vast power of her mind” unlocked, but now that it has, she’s stuck with it, and if she doesn’t manage the side effects, there’s no telling what that kind of madness would cause her to become. Addiction: In order to maintain control over her own powers, Victoria requires a certain mind stabilizing drug regularly. Without it, her powers begin to lash inwardly causing intense mental pain to Victoria that can mount to incapacitating pain. Taking a dose causes the symptoms to subside very swiftly though. Orphan: Due to having witnessed her parents’ deaths when they tried to stop the people who came to take her away, Victoria has a soft spot when it comes to orphans, and an intense hatred towards those who would put children in that state or take advantage of them. That’s what the brochure Victoria’s parents had been given said. Some men in suits showed up out of the blue, saying they had been taking readings in the area, and narrowed down a potential psychic in the area, and by narrowing their search, came to believe Victoria had the potential to have psychic powers. That much was true at least. These men were part of an organization seeking to recruit potential psychics and unlock their powers in order to have them invade the minds of others to track down people that would upset the status quo. Victoria’s parents, perhaps sensing something.. “off” about the sales pitch declined. Two bullets later, the suited men were dragging away a traumatized Victoria to what would become an ordeal over several years where she was experimented on and tested, all to forcefully awaken her psychic potential, alongside several other subjects. In more recent history, Victoria was able to escape during a resistance raid on the testing facility. With no home to return to, enemies in the organization that would stop at nothing to reclaim her as a resource, and little hope otherwise in procuring the medication she needed to keep her powers from destroying her mind, Victoria reluctantly joined the resistance forces to use her abilities against the power that was responsible for making her what she became. Victoria can be a little unpredictable due to fluctuations in her mental state due to the instability of her psychic powers, but usually she is confident if not necessarily personable. Her experiences in the Inquisitor program over several years there being poked and prodded have hardened her somewhat, so she can come off abrasive or intense, but tends to err towards reticence to avoid upsetting those around her that she doesn’t mean to. 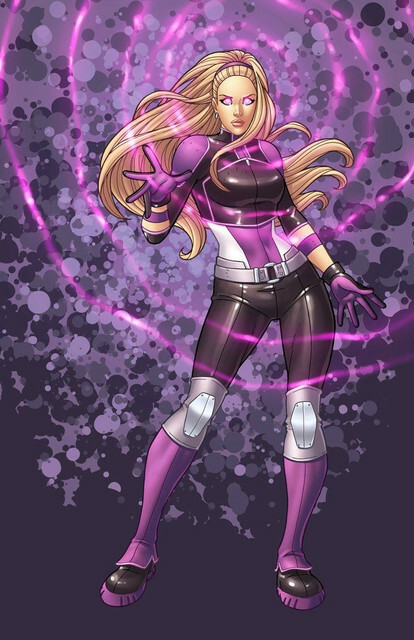 Victoria exclusively targets an opponent’s Will resistance with her Tactile Telepathy effects which can cause damage, hinder, or even control an opponent, but as her powers require her to touch a subject to affect them, her biggest challenge is her lack of mobility and lowish durability as she needs to get in close without getting harmed herself. So I did a bit of reworking on Inquisitor from the Young Injustice game, taking out her 5-u-93-r fueled strength and durability, making her much less ridiculous and I just fleshed out her tactile telepathic powers a bit as a result. She doesn't do a ton of damage, but does target a typically weaker resistance and can debuff to make it even easier to take foes down, so things can snowball once she gets a foothold. She herself isn't so durable, and has no mobility, balancing that potential power and making her something of a less orthodox glass cannon. I like the cyberpunk rebellion story that's building up. Another setting q: Technology skill. How well will that translate 1000+ years into the future? That makes my first draft unhappy. Here's my first attempt. They are missing a few things but I wanted to get the first draft out first. This is an homage to DC's Firestorm and Marvel's Capt. Marvel. Chem Blast: Damage 10: +10 (DC 25) Range: 50/100/250 ft.
As Binary, they are immune to mental effects and have better will. As Jacen and Jaina, they share a link stronger even than most twins do. Fires a foam of chemicals that are caustic. Height: 5' 8"	Weight: 175 lb. Jacen and Jaina Van Dyke were twin heirs to the Van Dyke Research Corp fortune. When their parents died under mysterious circumstances they became majority stockholders in the company. At the time of their father Tyler Van Dyke's death, Jacen was already Chief Financial Officer of the company and Jaina was Chief Technology Officer. Jacen moved up to CEO after approval by the board of directors. In their youth, Jacen and Jaina were inseparable. They traveled the world together. As teens, they were traveling through the alps when the stumbled upon a pair of dead aliens, later they found out they were Nree-ut. The aliens were both wearing matching circlets and the twins could tell the circlets had some kind of power. With study, Jaina learned how to activate the circlets but a short power spike happened because no one was wearing the circlets while she did tests. Finally, Jacen put one on and still nothing happened so Jaina put on the other one. Instantly Jacen's body vanish and Jaina's turned into a helmet that also transformed her into flying powerhouse. While in that form, Jacen existed only in Jaina's mind able to see and advise Jaina what to do. Over time, they learned how to make the circlets look less like alien tech and more like a choker necklace that they both wear. Either of them can initiate the transformation. And whoever initiates the transformation becomes the "driver" but because Jaina did it first, Binary always looks like a woman. They were reluctant to do anything as Binary until their parent's death. Then they sought out the culprits responsible and brought them to justice. Identity: The fact that these corporate bigwigs are also a superhero would be scandalous and be a reason the board might use to leverage them out of the company. Motivation: Justice: The mysterious death of their parents is why they started being Binary in public. The need for justice continues to motivate them. Power Loss: Some forms of force field, separating the twins could prevent them from forming the Binary amalgam. Relationship, Lack Thereof: Their closeness makes it hard for them to maintain personal romantic relationships. They are always inside each other's heads and it is kind of weird to be part of the experience your sibling and someone else kissing. Responsibility: They are important corporate officers in a major worldwide conglomerate. Apartment 5th (made up) door from elevator on floor B-6. Victoria is two doors down. Last edited by jmucchiello on Sat Mar 02, 2019 10:59 pm, edited 4 times in total. I'm not sure that this concept will work for the situation I have in mind, and I think you're giving this character the ability to exist in two places at once, (admittedly in a non-powered form) for no cost. What should that cost? I mean, I could just buy one of the twins as an alternate effect of the Helmet using Summon. So is 1 point really the difference here? I'll write it that way if necessary. For that matter, that might simply be their form now, one body with two spirits in it, the human aspects no longer available. That could make for some interesting drama too. I could work with that. Certainly it would change the complications list. I could work with that. Certainly it would change the complications list. To reclaim their wealth, they would have to go public.